The calendar says we were well into spring, which start in February in Santa Cruz. This has been one of the wettest winters on record and it doesn't want to release it's grip yet. The morning drive began under partly cloudy skies but gave way to steady rain and some hail at Big Basin. All that said 10 members showed up for our work day. After huddling in the Sempervirens Room at headquarters and hoping the rain would let up, we finally decided to venture out on the Redwood Loop Trail to take care of a down tree while still close enough to shelter in case things really turned nasty. Kurt Leal reported that a Tan Oak had fallen and was partially blocking the trail and we found it just where Kurt said it would be not too far from the campfire center. It didn't take long to clear the tree and debris from the trail area itself, but Norm then mentioned the clearing on the inside area of the fence line where the remainder of the tree still laid was used for an interpretive program each Halloween and asked if we could cut it back even further. Some more cutting and hiding of the debris and we were done. 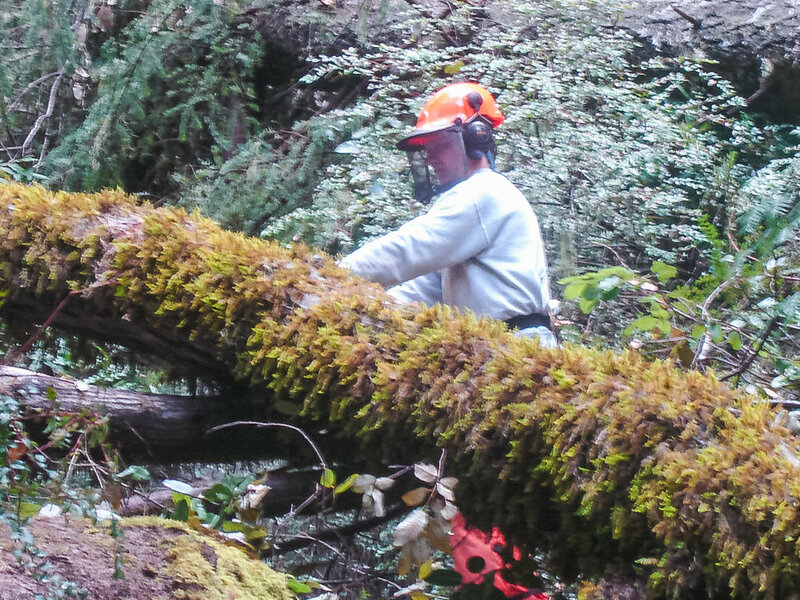 As Kurt's tree was being removed, others were dealing with drainage issues on the Redwood Loop Trail and we also saw a tree that was dropping widow makers so we took care of that as well before before breaking for lunch. 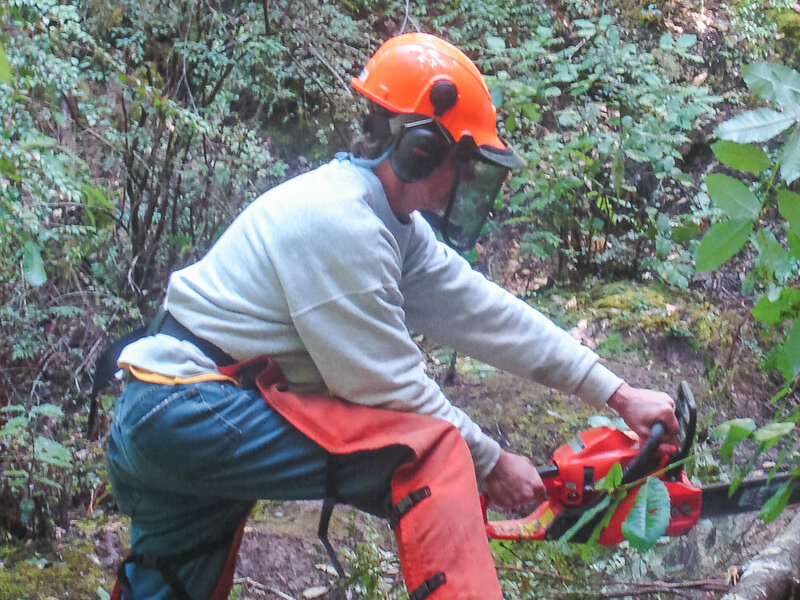 The rain had stopped by the time we finished eating, so part of the crew returned to the Redwood Loop Trail to continue the drainage work while the others headed up to check on problems on the Shadowbrook Trail between the Schultz Bridge and Huckleberry Campground. Just after passing a slide area that we couldn't do much about, we came to a large Tan Oak that had fallen length ways along the trail and stretched for about 20 yards. It took a while to clear the small debris before D2 and David B. began the big cutting, but we eventually got the area cleared just in time for a family with small children to give our work it's first test. Afterwards, we continued the hike up to the Huckleberry Connector Trail and then over to the Sequoia Trail finding a couple of small things before calling it a day. The crew put in 93 hrs and a big thanks to Herman Aster, Norm Beeson, David Bryan, Michele and Peter Gelblum, Janie Liefhelm, Janette Mello, Mike Peasland, David Philleo and Dale Stadelman, for their work on a slightly soggy spring day.